Dynamic Detailing specializes in premium automotive detailing, paint correction, and paint protection services. What began as a hobby detailing the neighbor's cars has turned into a passion for owner Daniel Kabel and his team. 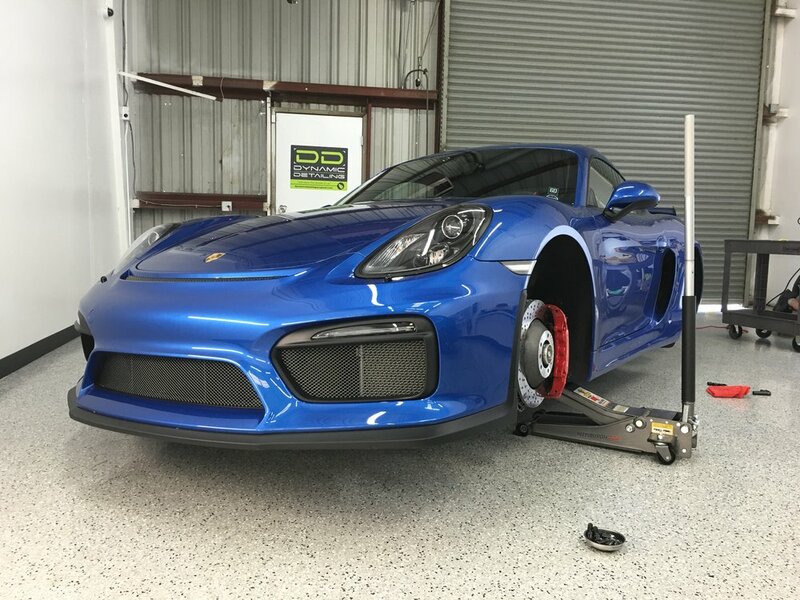 Certified as official Ceramic Pro installers and years of paint refinishing experience, Dynamic Detailing has the specialized skill set to keep your vehicle looking as clean as the day it left the factory. Race cars, daily drivers, exclusive exotics, motorcycles, you name it, we can keep it looking as great as any enthusiast's ride deserves to be. Dynamic Detailing is proud to offer applications for the full range of Ceramic Pro coatings. As one of the Bay Area's certified and trained installers of this revolutionary automotive coating, we stand behind our quality of work and the guaranteed protection of any one of our Ceramic Pro packages. Whether you're looking to protect your interior, wheels, calipers, or any painted surfaces, there is a Ceramic Pro package for you. Glossy, slick, and self-cleaning, this nano technology allows the Ceramic nanoparticles to fill the smallest pores in the paint which makes the Ceramic Pro glass shield shiny, smooth and extremely slick or hydrophobic. Ceramic Pro dramatically lowers the surface tension preventing environmental contaminants such as: bird droppings, bugs, dirt, tar and graffiti paint from bonding to the surface. Water easily removes dirt from the surface by encapsulating it while rolling off the surface. This is called the self-cleaning effect. Coating is applied to paint, headlights, tail lights, wheel faces, windshield, and plastic trims. Give Your Wheels And Calipers The Protection They Need From Harmful Brake Dust And Extreme Temperatures. Ceramic Pro Coatings Make Cleaning A Breeze Too, Even With The Most Intricate Wheel Designs. ASK US ABOUT OUR SPECIFIC "WHEELS OFF" COATING PACKAGE. Xpel is a Paint Protection Film that can be applied to various parts of your vehicle's exterior body work in order to provide up to 8 mils of additional layered protection on top of your vehicle's paint surface. The film is useful for protection of the areas of your vehicle that are exposed to rock chips, airborne debris, and harsh sunlight. Xpel PPF protects your vehicle while maintaining a brilliant shine and an invisible finish that is backed by the manufacturer's 10 year warranty. With various vehicle coverage packages available, there is protection option for any of your needs. Transforms the appearance of traditional paint to a matte finish when using Xpel Stealth. 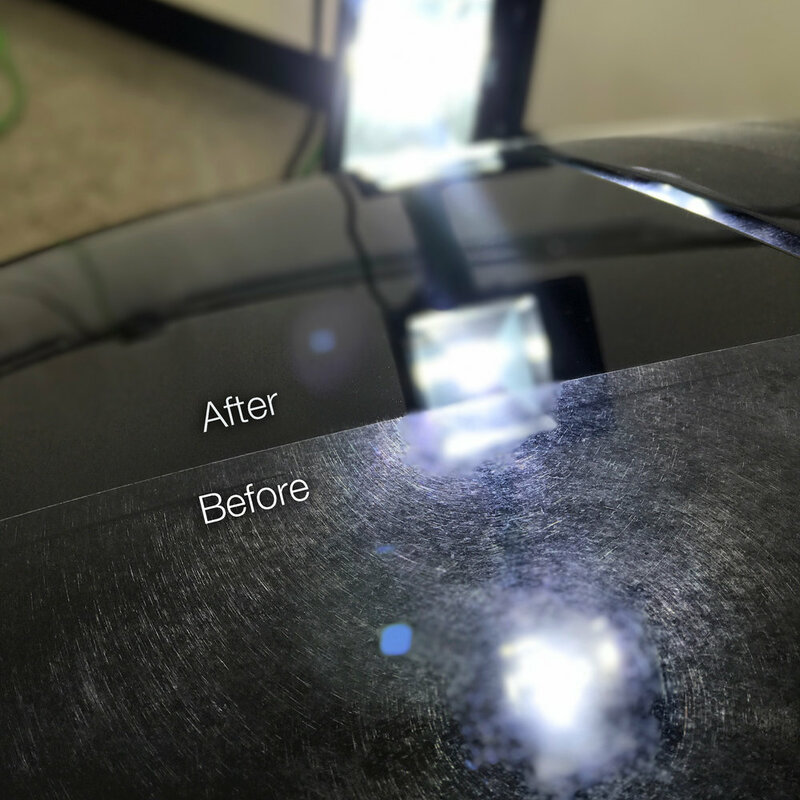 This is a before and after of paint correction on a car with heavy swirls and scratches. This car was abused from automated washes all it's life, however we were able to restore the paint to near factory conditions. Aside from the swirl marks being removed, you can also notice a difference in the depth and gloss of the paint. "This is my first time using ceramic pro and I must say I can't see myself going back to traditional waxing. The car is super glossy, the coating Is extremely smooth, water beads up and literally drips off the car and bird droppings clean up effortlessly without harming your paint. I'm liking this product a lot!" Extremely easy, I call them and they schedule me in. In times where I am busy, they have even given me the option of coming to me or coming to pick the cars up and dropping them off. Excellent service!" "Let me tell you, I was not disappointed. Dan and his team did an outstanding job that you'd think this 10 some-odd year old car was brand new and right off the lot. They did such an exceptional job that I couldn't stop bringing my car back. Dan treated my car as if it were his very own in that he didn't miss a single corner when cleaning the exterior or interior. I couldn't have been more satisfied with his work."